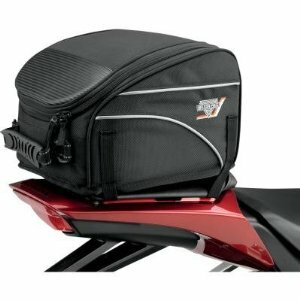 Tilted Horizons: Nelson-Rigg Seat Bag Giveaway! #3 in a series to help clear-up the Tilted Horizons gear closet and garage of unused, barely used and test items. This Nelson-Rigg CL75 S tail bag/seat bag (with rain cover) has been test-fit only; it has never seen the sun. It would be great on a small motorcycle, or any bike with a small pillion seat or pad. No bungies: the straps run under the seat. For a chance to win this item and have it shipped to you free anywhere in the USofA, zap me an email (address is listed under my Profile) with the answer to this trivia question: In 1958 the company that brought us Gore-Tex (how did motorcyclists live without it?) was created in the basement of the founders' home in what city and state? The winner will be chosen in a random drawing among all correct entries received no later than midnight EST May 29, 2011. To double your chances, send a second email letting me know that you visited at least three of the websites displayed at the top of this page (this is how the last winner succeeded). For a third entry, let me know you viewed at least five. BTW, if you've entered prior contests, you're welcome to try again, even if you've won. Good luck! Addendum 6/27/2011: The bag was won by Joanne of Waverly, NY, known on several social networking sites as LadyFF1481. As luck would have it, a few days after mailing the item to Joanne, I had the pleasure of meeting her at a social function during the Americade Rally.